Faithful readers: please forgive my lapse. I’ve been silent for nearly six months, causing some to wonder if I’m still blogging, or even alive. Today I begin composing anew — SEASON SIX! — while continuing my search for adventures to fuel my writing and banish writer’s block. It becomes more challenging to have a ‘beginner’s mind’ (shoshin*) in a place that’s become so familiar and so known. Sharing with all of you helps me accomplish that. My intent, as always, is to invite you along as I encounter Great and Marvelous Things as a seasonal ranger in Canyonlands National Park. The high desert of the southwest is my playground and work station, and I love to pique your curiosity and whet your interest. Backlogged winter adventures and off-duty exploits are fair game for blog posts, and I delight in answering questions from my readers about national parks, deserts, wilderness, my job, why I perpetually have bad hair days, anything at all. I’ve enjoyed meeting some of you here at the park and I appreciate every person who takes time to read my thoughts. While it is still painfully slow to load photos with wilderness internet speeds, I hope to add albums from time to time. Let me know in the comments what you’d like to see in this blog, and I will incorporate those into upcoming posts. How many of you are on Instagram? I believe I can get that going, too. 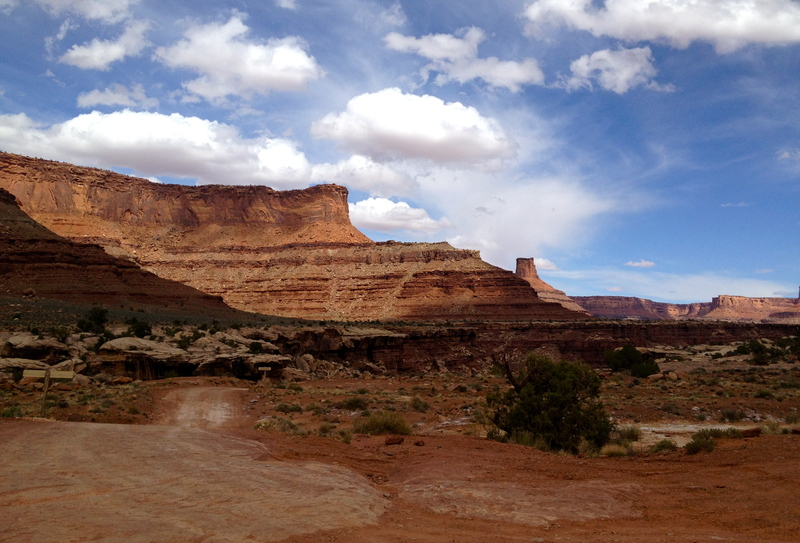 The photo above was taken from the base of our Shafer Trail, the old mining switchbacks that took uranium hunters down into our canyons in the ’40s and ’50s. Thank you for your patience, my friends. Glad to be back! *having an attitude of openness, eagerness, and lack of preconceptions when studying a subject, even when studying at an advanced level, just as a beginner in that subject would.